The Malaysian Prime Minister Mahathir Mohamad has accused countries he called the "great practitioners of democracy" of "terrorising the world." Dr Mahathir took care not to name the countries, though in the past he has been a regular and outspoken critic of Israel, the United States and Australia. The comments were the latest in a string of controversial remarks from Dr Mahathir, who is due to retire from office on 31 October. A speech last week in which he said Jews "ruled the world" has been widely criticised by Western governments and Jewish groups. "It would seem that the great exponents and practitioners of democracy believe that the way to spread the doctrine... is by terrorising the world." In his latest speech, made in the Indonesian city of Yogyakarta, Dr Mahathir criticised states who launched "massive retaliation" for terrorist acts. "We see states launching massive retaliation, not just to curb suspected terrorists, but his family, his home, his village and his town. "It would be ridiculous to think that such attacks do not terrorise the innocent. "It would seem that the great exponents and practitioners of democracy believe that the way to spread the doctrine and to break down resistance is by terrorising the world," he said. 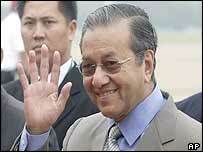 Dr Mahathir, who is due to step down after 22 years in office, seems determined remain controversial to the last. His recent remark that "Jews rule the world by proxy," brought widespread criticism which he said only proved he was right. The 78 year old leader has been a frequent critic of Western policies towards developing countries. During his speech on Wednesday Dr Mahathir also attacked the World Trade Organisation (WTO), whose aim is to liberalise international trade. "Like the World Bank and the IMF (International Monetary Fund), the WTO is now being made into yet another instrument to enrich the rich and impoverish the poor," he said.